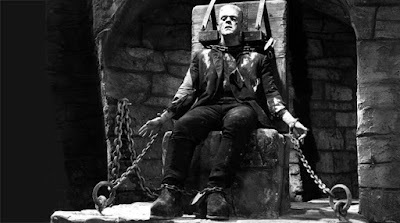 Although Karloff’s performance in the original Frankenstein is groundbreaking and unique, I keep going back to the sequel. 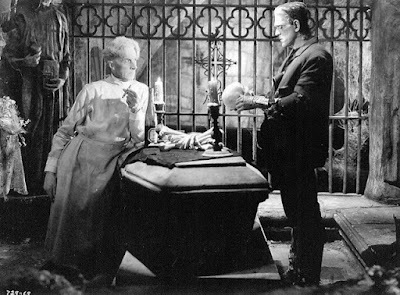 Karloff’s performance in Bride of Frankenstein is inarguably one of the great performances in film history. Far from getting lost in Jack Pierce’s elaborate and iconic make-up, Karloff inhabits, animates, and even adds to it. Karloff had a partial denture on one side of his mouth, which he agreed to remove so that cheek would collapse in, giving the impression of an emaciated, sallow corpse. Showing an attention to detail that is rare, the monster’s makeup changes as the film goes on. Karloff is burned in the windmill at the start of the film, and as the narrative proceeds, we observe his scars healing and his hair growing back. This metamorphosis underlies and bolsters the monster evolving as a character as the film proceeds; both his personality and his physical appearance change and grow. I find great irony in Karloff’s performance being the subtlest in the film; after all, he is the monster. Set against the backdrop of Ernest Thesiger’s over-the-top histrionics (“Get away from that leeeveeer, you’ll blow us all to atoms! ), doomed Colin Clive’s whining (“I won’t do it. I can’t do it!”), Valerie Hobson’s feinting madness (“I see it, a figure like death, getting nearer… NEARER! ), O.P. Heggie’s sad, passionate earnestness as the blind hermit (“Thank you for taking pity on me…”), Karl’s gleeful lawlessness (“[That heart] was a very FRESH one!”), and Elsa Lancaster’s screaming and hissing, Karloff seems positively restrained. This helps the audience empathize and side with the monster because every other character we encounter is a raving maniac. The monster seems reasonable by comparison. Sometimes I think that Karloff’s monster in Bride of Frankenstein is a handy metaphor for all of us rabid movie fans. Frankenstein’s monster meets indifference, hatred, and abuse from all around him. He didn’t ask to be born. The rules make no sense to him. He has love to give. No one wants this love, so he turns to the dead. Those of us who sometimes eschew real life for the simulacra of film and the escape of entertainment just might identify with this. In the documentary The American Nightmare, University of Chicago professor Thomas Gunning famously suggests that the movies originally promised us immortality. Both the famous and not so famous would be captured forever on film. They would be preserved. But that is not what film wound (!!!) up doing. Film is merely the shadow image of a person that is preserved, fated to repeat the same simple actions over and over again for all of eternity. Film, which promised us immortality, winds up giving us ghosts. To those us us who sometimes prefer the company of ghosts to the company of the living, Boris Karloff’s monster is smiling somewhere. Or growling. Happy Halloween, my fellow necrophiliacs. You are wise in your generation, JB. Ooh, I like how turned that metaphor on its bolt-necked head - it makes every movie a scaaaary movie. I think I'll plan on making the Universal Monsters a part of next year's SMM - it's been a few years since I last tried and wasn't super-grabbed by them but, for me, first-time watches of classics can be tainted by expectations so I can see liking them a lot more. Happy Halloween J-Bones! Right back at you, Sol. Boo. You've given me the push I needed to jump back into the Universal Monster films this year. 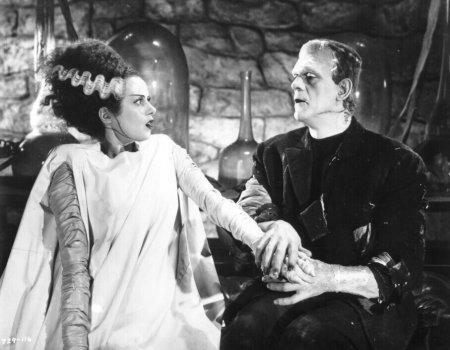 I've been loving it and I can't wait to check out Bride of Frankenstein after reading this. Thanks for the spooks JB.